A new offering from The Curve shopping mall is Goodsaltz, the same space once occupied by Garden Cafe. 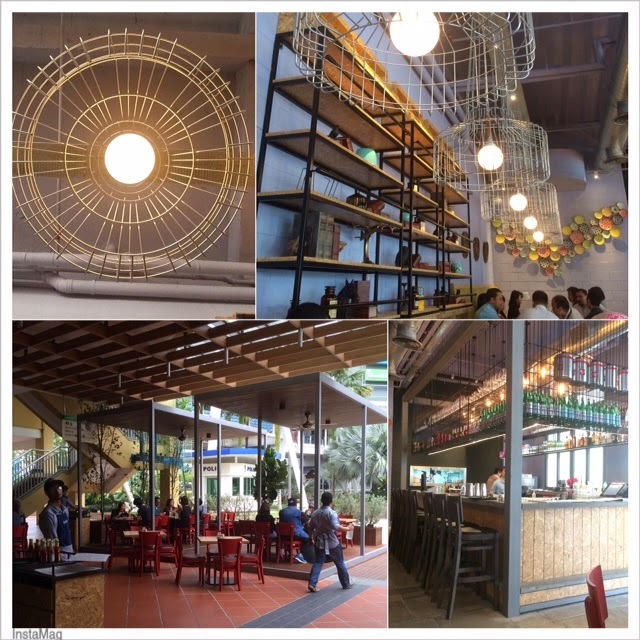 The ambience is simple, nice with a creative twist of using recycled items around as decor items around the restaurant. Definitely a great place to chill after shopping at The Curve or the nearby IKEA. Diners are able to choose whether to dine inside the restaurant or choose the fresh air (*haze*) outside while checking out the crowd. Goodsaltz's concept is a family restaurant filled with good food and friendly vibe (got that line from their website. *winks*). But it's true, the staff are friendly and welcoming. When I went there, the waiter even kneel down up until the table level just to take my order. What about the food? They serve the usual comfort food with some unusual combinations. So if you're ready to be surprised, here's the place. Tuna J.O.B. (RM16). Jicama, orange, barley served with green tea induced french dressing. I find that it was too tangy for my liking. Masala Fried Spaghetti (RM24). Spaghetti fried with masala spices, ground chicken and fresh tomatoes. A rather creative combination, but not memorable enough to make you want to order it again on the next visit. Banana Nutella Crepe (RM14). Vanilla ice cream and Nutella with banana crepe roll. Nutella is part of its name, but unfortunately, the banana really overpowered the Nutella. Perhaps they should be more generous in their serving of the Nutella. Butterscotch cake (RM14). A simple cake, really. My honest opinion, the food was just average for my taste bud. With that said, it's only fair for me to come back and perhaps order different food. If you're an adventurous foodie, by all means go explore this place and let me know what you think of the place or which food I should order next. INFO: goodsaltz, Lot G41, Ground Floor The Curve, No. 6 Jalan PJU 7/3, Mutiara Damansara, PJ. Tel: 03-7733 7860. Check out their website, Facebook and Instagram.